Pacific Gas and Electric is telling shareholders it expects to be held liable for at least 14 blazes during last October’s firestorm, but the utility does not believe it will be found liable for the largest single one — the Atlas fire in Napa County. That fire destroyed more than 700 homes and left six people dead. Earlier this month, Cal Fire announced the results of its investigation. Blaming trees falling on a power line for starting the Atlas fire, which ultimately charred a total of 51,624 acres. Without citing specifics, Cal Fire has also referred the case to Napa county prosecutors to determine if PG&E violated state law. But, in a Monday filing that is short on specifics, the utility suggests it could be in the clear on the Atlas fire, and the Highway 37 fire in Sonoma County. 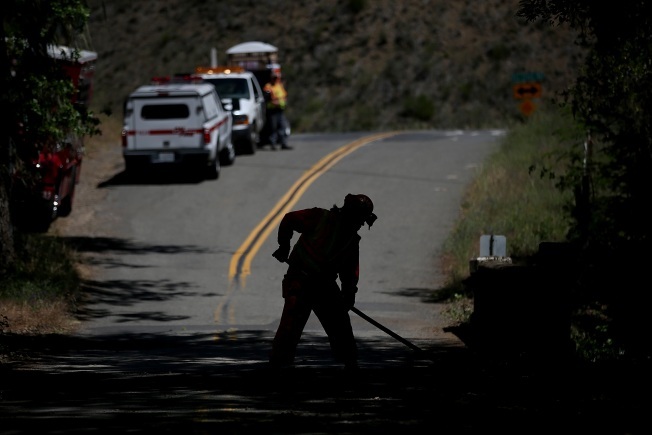 That filing notes, "PG&E Corporation and the Utility do not believe a loss is probable at this time, given the information currently available," the utility told shareholders in a regulatory filing about the Atlas and Highway 37 fires. "However, it is reasonably possible that facts could emerge that lead PG&E Corporation and the Utility to believe that a loss is probable, resulting in the accrual of a liability in the future, the amount of which could be significant." When discussing the 14 other fires that have been probed to date the utility writes, "PG&E Corporation and the Utility currently expect that they will record a significant liability for losses associated … "
Those fires include the La Porte, Honey and Cherokee fires in Butte county, the Lobo and McCourtney fires in Nevada County, the Redwood fire in Mendocino, the Sulfur fire in Lake County, the Blue fire in Humbolt County and the Pocket fire in Sonoma County. The company said it also will be on the hook for a series of five blazes that merged in Sonoma and Napa counties — the Nuns, Norrbom, Adobe, Partrick and Pythian fires. Those fires took 3 lives and destroyed a combined 56,000 acres and 1,355 structures. Cal Fire determined all were blamed on trees falling onto PG&E lines. PG&E says it believes it will be ultimately be found liable for the La Porte, Cherokee, Nuns and Redwood fires even though Cal Fire has closed its probes without finding any regulatory violations. The filing also notes the utility now faces 200 complaints filed on behalf of 2,700 victims. The company cites possible defenses to those suits, "including alternative potential origins and weather and climate issues." In the meantime, PG&E has started alerting its customers that they are considering cutting power in certain high risk fire zones during high fire danger times. It's one of several measures the company is now considering, including disabling thousands of automated circuit breakers known as reclosers — a technology the company largely kept on last October even though it is known to spark wildfires. In a message to users the company writes, "For your safety, it may be necessary for us to temporarily turn off electricity to your neighborhood or community when extreme fire danger conditions occur." The letters were sent out this week, and were signed by the "PG&E Wildfire Safety Team." "We know how much you rely on reliable electric service and would only consider temporarily turning off power in the interest of safety, and as a last resort. If we need to turn off your power, we will attempt to contact you in advance to ensure you have enough time to prepare. We will also provide updates until power is restored," the letter read.